It’s gotten pretty darn cold, pretty darn fast. We’re very lucky because my oldest son’s bus comes right to the driveway, but since he can have any where from 3 to 5 different bus drivers a week, all with a seemingly different idea of who should get picked up when, we tend to stand at the end of the driveway from anywhere between 10 to 30 minutes. Since we live in Scandinavia, that means we get cold. With that in mind, and a need for small gifts that will fit in those lovely stockings we’ve hung by the fire with care, I made the boys each a set of hand warmers. This is one of those presents you can work on while you relax in front of your favorite TV show after the kiddos are asleep. Step 1: Cut out 3 inch base circles for each hand warmer. Then either hand draw or use the font provided in the supply list to make each superhero logo. I went with the hand drawn method, but the font has pretty much any of the superhero symbols you can imagine. Also cut a 3 inch diameter circle for each backing. Step 2: Glue the pieces together to form your hand warmer front. Optional: sew around each piece for added security. Step 4: Turn right side out and fill with rice or lentils. and place the hole inside the hand warmer. Be careful not to over fill the hand warmers. You’ll want to leave enough space to turn each side under. Use a slip stitch to close up each opening. Simply place each hand warmer in the microwave for about 30 seconds, place in your coat pocket, and enjoy the warmth of nice toasty hands while awaiting the bus. Added benefit, if you don’t live in a cold winter climate, these make great bean bags. The boys in this house love superheros but if your little one is into Backyardigans, Super Mario Brother’s, or Star Wars, feel free to follow the same process changing up the “faces” of each hand warmer. And then e-mail me a pic, cause’ I want to see them. Now, I have some exciting news for you . 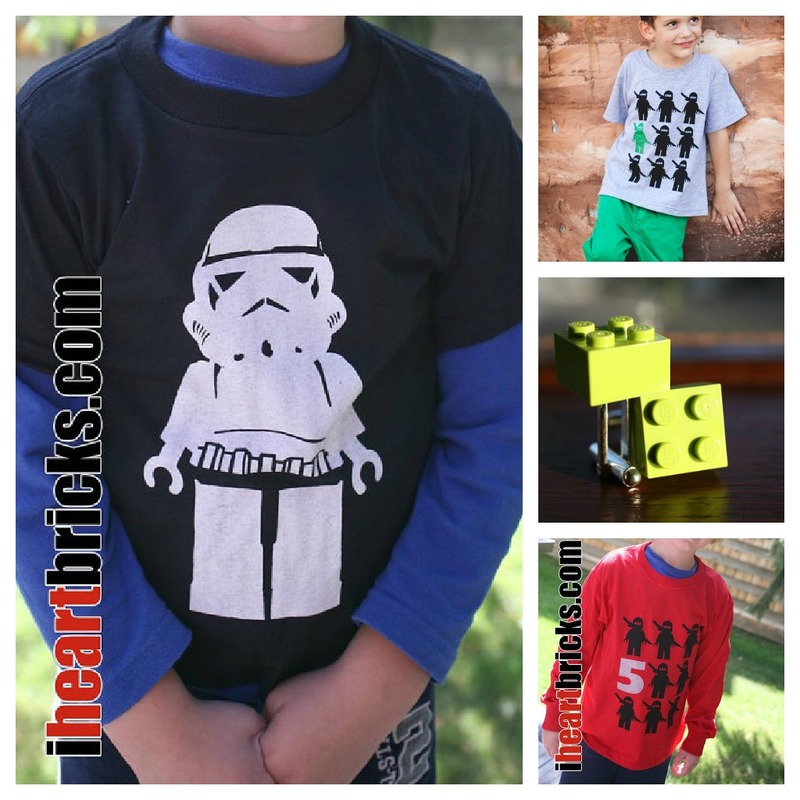 . .
meet today’s giveaway sponsor, IHEARTbricks. Jaime and Tricia hand screen print Lego mini-figures onto 100 % cotton Fruit of the Loom T-shirts. You’ll find all of your little guys’ favorites here, from Ninjago to Star Wars. These are just a few of my favorites. Sizes range from toddler to adult and many of their shirts can even be personalized with your child’s name or age. One lucky winner, will be chosen, at random, to receive an iHEARTbricks T-shirt of their choice (excluding tie dye and personalization). Sorry folks, this is for U.S. residents only. To enter: hop over to their shop. Then come back and comment below telling me which Lego mini-figure your child would most like to see on his/her shirt. Click here to go on over to If Only They Would Nap for this adorable baby shoe tutorial. oooh my son would LOVE the Ninjago! What a *brilliant* idea! My boys would love those hand warmers. Perfect for the school run now it's a bit snowy here. So cute!! I made some handwarmers out of faux velvet, and they worked well. I love the felt patterns! It is not cold enough where I live to need hand warmers, so I love the idea to use these as bean bags!